These were just some of the appreciative comments from an enthusiastic audience on Friday 6 October, following a performance by instrumentalists from Chetham’s. 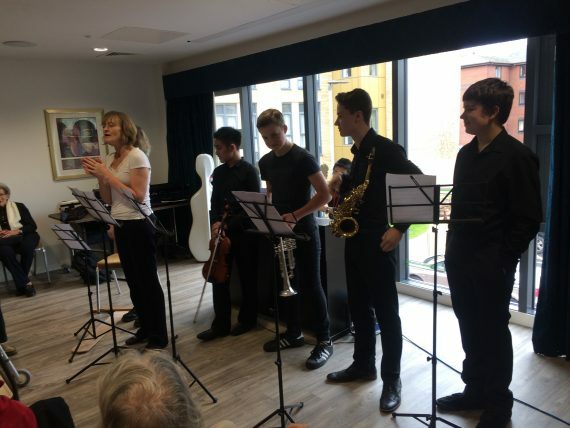 As part of the school’s Community Music programme, designed to take live music to people who might otherwise have little access to it, six Year 10 students visited Belong Morris Feinmann in Didsbury, a new specialist home for dementia and for older people living independently in apartments. They presented a varied programme, from jazz standards on saxophone and keyboard music by Bach, to a dazzling violin showpiece by Kreisler. Two familiar songs – The Way You Look Tonight and Moon River – performed by the whole group, added a touch of nostalgia and got the audience singing along. After the concert, the students mingled with audience members and heard their stories of dance bands and concerts they attended in their younger days. Needless to say, they’d love us to visit again soon! Then, on Friday 13 October, the Community Music programme continued with a workshop led by Ros Hawley, clarinettist and specialist in music and health. She shared her experience of working at the Seashell Trust in Cheadle, which supports children and young adults with complex learning disabilities and additional communication needs. Students from Chetham’s engage in music at the Seashell Trust several times a year, the first visit being planned for later this term. The date we have in mind would be, say, February next year – certainly after Christmas, and a date convenient to yourselves.